Once again I found myself on board a SAA flight, much to the chagrin of my wife, in pursuit of Tragelaphus strepsiceros. My obsession with Kudu began 17 years ago when I first read The Green Hills of Africa by Ernest Hemingway before my first trip to the Dark Continent. Little did I know I was to follow in "Papa's" footsteps. This was to be my third try in five years for kudu. During my prior two trips, the kudu had lived up to his reputation as the "Grey Ghost of Africa". All I had to show for my previous attempts was miles on my boots, memories of Africa and an empty spot on my wall reserved for a Kudu. On this hunt I was hoping the old adage, "Third times a charm" would hold true. The first morning of the hunt found me awake early, anxiously waiting to hit the bush, in pursuit of a worthy opponent. After a few hours of hunting that first morning I realized the conditions were going to make for tough hunting. I had hunted this area some 14 months ago and differences in the terrain were striking. Areas that were once lush and green, were now brown and withered due to the lack of rain. Previously when I had hunted, the Kudu were in rut, which in turn made them more active. The breeding season was now over, and the old bulls were sequestered in thick stands of marula trees, recouping from the stress of the rut. Over the course of first five days I did manage to spy two "shooter" bulls for a total of about 20 seconds before they once again disappeared into the bush. At least they were not completely invisible I kept telling myself. It never ceases to amaze how an animal that weighs in excess of 600 pounds and sports horns in the 50-60 inch range can glide through the bush without making a sound and disappear. After 5 hard, tiring, and dirty days of hunting my Professional Hunter Xander and I had nothing to show for our effort; except cuts, sunburn, and sore calves from walking in the fine red sand that seems to get into everything. That evening it was a bit quiet at dinner and later around the fire. I was 5 days into the hunt and had yet to even get the sticks up on mature kudu. We all were feeling a bit of tension wondering if I was going to get skunked once again. As we sat around the fire, jokingly we thought of perhaps sacrificing a virgin to the hunt gods, but then realized finding a mature kudu bull would be easier then finding a virgin in the African bush. Instead we decided to drink an extra beer or two, hoping that a bit of fuzz in the morning would change our luck. with a bit of grit in our belly. After shaving my tongue we headed out hoping to get on the board. After spending the entire day walking and trying to play the swirling wind we realize that we need a new game plan. Xander and I decided to head back to a valley chock full of thick marula trees, except we won’t head in. The area is so dry and full of leaves that any animal would hear us from a mile away. We decide to set up in a clearing and wait for the kudu to emerge from the valley and see if we can then do a spot and stalk. With about 40 minutes of shooting time left the wind all of sudden changes direction, blowing our scent down into the valley and alerting the kudu to our presence. Disgusted we pick up and start to walk, formulating a new game plan as daylight fades. As we are complaining about our continued bad luck, Xander looks up from where he is sitting and calmly states there is a large kudu bull coming our way. The kudu is walking towards us broadside with a huge fallen tree between us and him. My heart is pounding so loud I am afraid the Kudu will hear us. As he gets closer I keep waiting for him to hear, see, or smell me. I am not afraid to say I am nervous, feeling like a young boy on his first date. The kudu continues to come closer, walking like the regal animal that he is. As he draws near, I lean against the rifle against the tree, find him in the scope and slowly squeeze the trigger and nothing happens. In all my excitement I forgot to take the safety off! I slowly take the safety off, find the spot, and pull the trigger. The kudu turns around and takes off... like nothing happened. After the shot, Xander asks me how did the shot feel? I tell him it felt good and I was dead on. After a few minutes we compose ourselves and begin to look for blood. We reach the spot and see a few drops of bright red blood in the sand. Ever so slowly we follow his tracks to a sheep fence that he easily cleared. As we cross the fence into patch of thick bush we see more sign of bright red blood. My heart quickens, and while I don’t dare say it, I think to myself: he is mine. We find him not more then 30 yards from the fence and he is down. As I draw closer, I stop from a distance of 10 yards to fully admire the animal. There will be time for photos. Right now I just want to sit back and take it all in: the fading African sun, the fine red sand, the groves of marula trees, and the kudu in his entire splendor. To have him in the salt after so many days and miles is a feeling that everyone should experience at least once in their life. I later tell Xander it's like asking the prom queen out on a date and having her saying yes. We stand around the kudu, taking pictures, admiring the beautiful horns and unique markings on his hide. My personal quest for the Grey Ghost of Africa has finally ended. I like how the author never gave up in his pursuit of a Kudu. He should have went to the Kalahari after the first time. He probably would have been sucessful sooner. 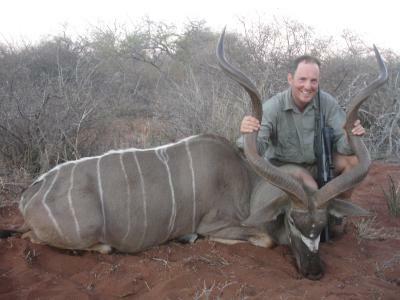 A fabulously exciting story of a Kudu hunt. Makes me want to do it. You really know your Africa!! Congrats on a beautiful animal after a persistant hunt! !